Many parents, teachers, and students at the condemned schools were left fuming. But not everyone had a bad night. PS 204, a highly-rated elementary school in Morris Heights, received a green light from the Panel to move into a new building (pictured above) at 1740 Macombs Road, where University and West Tremont avenues meet. This means PS 204 will be saying goodbye - and good riddance - to its current building, an ageing, castle-like structure and one-time synagogue on West 174th Street. In a telephone interview, the school's principal Marcy Glattstein called the new location a "gorgeous site" which will offer "all the things that the children of this school have not had" – such as a gym and a library. She said the move, scheduled for the summer, in time for the new school year, was "long overdue." All right, so the Norwood News has made a quantum leap into the digital age and is now on Facebook and Twitter. We're still taking baby steps here, but over time I'd really like to see these social networking forums be a great place to share and update stories, exchange information and post events and programs and whatever else. The Bronx News Network will remain the place for larger Bronx issues and stories, but check these pages out for more hyper-local Norwood News-related information. That means anything related to Community Board 7, the 52nd Police Precinct, and the neighborhoods of Norwood, Bedford Park, North Fordham (or Fordham-Bedford, if you prefer) and University Heights. Just go to the Facebook and Twitter and seach "Norwood News." It may take us a while to fully integrate this into the routine, so have patience and make suggestions on how we can make it work better. Happy Friday everyone! Breaking news alert: It's cold! According to weather.com, it's about 19 degrees in the Bronx this morning, but should warm up to a balmy 25 sometime this afternoon. As my wife said this morning: "But it looks so nice out." Anyway, on to the news. Let the games begin in the 86th Assembly district where embattled incumbent Nelson Castro finds himself up against Democratic party-backed challenger and district leader Hector Ramirez. City Hall reporter Andrew Hawkins starts his story off with: "Nelson Castro is in trouble." Here's James Fergusson's 2008 story on Castro. Here's the Norwood News' story on Ramirez's challenge. Four bear cubs rescued in Alaska made their debut at the Bronx Zoo. State Senate Democrats, including Bronx pols Jeff Klein and Pedro Espada, are pressuring Gov. David Paterson to collect taxes on cigarettes sold on Indian Reservations. To demonstrate how this issue affects local commerce, the Daily News reports that Espada had an aide go buy two packs of Newports for $10 (with taxes one pack of smokes in NYC is about $10). The question on smokers' minds: which bodega did they go to? The Daily News reports that state investigators have found "credible evidence" that a 14-year-old boy was sexually assaulted at Bronx Children's Psychiatric Center. Labels: 'the bronx kill', Bronc Children's Psychiatric Center, freddy ferrer, green jobs, hector ramirez, hot 97, Jeff Klein, Nelson Castro, Pedro Espada Jr., ruben diaz jr. The latest edition of the Norwood News is out on streets and online now. Check it out. Tax refund anticipation loans (RALs) siphoned $54.7 million from the pockets of low income New Yorkers in just one year, according to a report issued last week by the Neighborhood Economic Development Advocacy Project (NEDAP), a New York City-based financial justice group (disclosure: I sit on the organization's board). More than 40% of this amount came from the pockets of Bronx residents, at an estimated cost of nearly $22.5 million. 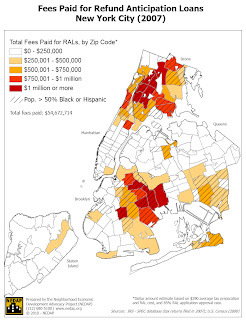 Based on its analysis of recently-released IRS data for tax filing year 2007, NEDAP found that RALs were overwhelmingly concentrated in New York City's low- and moderate-income neighborhoods of color, especially in the West Bronx. RALs drained millions of dollars from neighborhoods throughout the Bronx, Upper Manhattan, and Central and Northeast Brooklyn. While the number of RALs made citywide dropped between 2006 and 2007, both the number of RALs and money spent on RALs went up in the Bronx; our borough’s share of NYC dollars spent on RALs jumped from 33% to 41%. The four top zip codes for money lost to RALs were all in the Bronx, including 10453 which was first in the City at $1.74 million. 10456, 10452 and 10457 rounded out spots two through four. Also in the top ten citywide were zip codes 10458, 10468 and 10467, each of which saw more than $1 million going towards RALs in 2007. RALs are high-cost loans, secured by taxpayers’ projected tax refunds and Earned Income Tax Credits (EITC). Aggressively marketed to lower income taxpayers as a way to obtain fast cash, RALs carry interest rates from 50% to 500%, according to the National Consumer Law Center and Consumer Federation of America. City Council members were appointed to their respective committees and chairmanships last week and we thought we would give you an idea of what issues the Bronx delegation will be focusing on and in which areas they will hold some sway. Click "Read more" at the bottom of this post for a listing of all your Bronx Council Members and their assigned committees and chairmanships. Oliver Koppell of District 11 kept his position as chair of the Mental Health Committee, continuing a streak that dates back to 2006. Also, newly-appointed District 14 council member Fernando Cabrera has become chair of the Drug Abuse Sub-committee. (Drug Abuse is a sub-committee of the Mental Health Committee; it's one-person subcommittee formerly chaired by Annabel Palma.). Meanwhile, Larry Seabrook (District 12) has maintained his place as chair of the Civil Rights Committee. Each Council Member receives an additional stipend for those expenses related to the committees which they chair, and yet another if they hold office (although, in the Bronx's case, the only applicable member is Joel Rivera of District 15, who is also Majority Leader). From Village Voice Cover: "I Blog NY"
This is a testament to everyone who makes the blog what it is -- Alex Kratz, James Fergusson, all of our interns, and terrific guest bloggers like Adi Talwar, Gregory Lobo-Jost and Nick Napolitano. Bernard Stein, our colleague at the Hunts Point Express and Mott Haven Herald is also a valued contributor. And everyone who comments and links to us also helps make this blog what it is. The piece on BxNN is on p. 4 of the artice linked above. But the whole thing is a great read, and our thanks to Voice blogger/reporter Roy Edroso for the great coverage. A group of Bronx teens are seeing a big pay-off for their hard work with Capital One Bank. Last Thursday, on January 21st, New York State Comptroller Thomas DiNapoli awarded Capital One Bank, the Fordham Leadership Academy for Business and Technology and its students the first-ever Your Money New York Recognition Award for Financial Education. 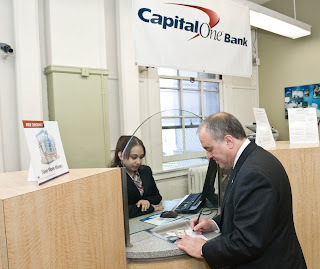 Capital One Bank started its student program in October 2007, selecting ten students to run a bank branch with supervision at the Fordham Leadership Academy. The students would be working three times a week, under Capital One management, developing practical financial knowledge and skills, not only applying them to the work environment, but carrying this knowledge into their college experience and careers. Capital One also ensured that its program's participants received the proper resources to enable effective saving for future financial responsibilities, including college savings. In addition, the branch's services were made available to school administrators and teachers. Hello, everyone. We're back with your News Roundup for the past two days! The sounds of protest from hundreds of students, families and teachers were not met as it was decided early this morning that 19 of the city's schools will be closed due to poor academic performance, the Bronx's Christopher Columbus High School included. By 2:40 a.m., over 300 people had spoken at the panel held at Brooklyn Technical High School, only a handful of which were in favor of the closings. Despite these opinions, nearly every closing was met with an overwhelming majority vote. One representative from Queens laments the decisions: “Listening means to hear but also to digest and allow the information to have an effect on our opinion." In related news, the Bronx's Alfred E. Smith Career and Technical Education High School was one of lucky ones. The Department of Education decided to keep the high school's doors open, thanks to an outpouring of community support. An update on the wildly successful Bronx gun buy-back program: $184,000 was paid for 1,186 guns. Bronx Borough President Ruben Diaz Jr. said, in reference to the very recent shootings of two Bronx women, "This is bittersweet. These 1,200 weapons symbolize...another Sadie Mitchell...another Vada Vasquez. Perhaps we'll avoid another Vada Vasquez with these weapons being here." Police Commissioner Raymond Kelly is happy to announce that the guns will be melted down and turned into coat hangers: in his words, a "much better use of them." Several Bronx men were given the opportunity for employment in tearing down the old Yankee Stadium, only to be lied to and left where they started. David Phillips, the Goodwill job developer in charge of placing the men packed up and took off without notice. The "Back to Work" program's response: "move on." Early this morning, a pedestrian was hit by a car and has sustained serious injuries. The driver of the car was also injured. The accident took place on East 151st Street and Grand Concourse. The area has been closed to traffic on the northbound side between East 150th and 151st street for investigations. Congressional District 16 (Morrisania, Mott Haven and Bedford Park) has been found to have the highest household hunger rate in the nation, according to a report by Gallup and the Food Research Action Center. The figures are startling, as families were asked whether they had ever been in a situation in which there wasn't enough money to buy necessary food. The percentage of households suffering from hunger in District 16 were found to be as high as 36.9%. The New York Post reports on a neighborhood's response to Praxis Housing Initiatives' plans for a permanent supportive housing development on White Plains Road in Wakefield. While the Q&A session on January 7th attempted to clarify the difference between "permanent supportive housing" and "homeless shelters," residents remain uneasy and skeptical. The Westchester Merchants Association's case with the Department of Homeless Services has been tossed by a Manhattan judge. The Bronx merchants argued that Homeless Services should be required to do a comprehensive study of a neighborhood before creating a shelter there. Local leaders were disappointed by the verdict as well: John Bonizio, president of the Westchester Square Merchants Association, said, "They don't consult with the community boards. They find a spot and put it in." To end on a brighter note, the sculpture in front of the Bronx River Arts Center in West Farms Square is still free of any graffitti, six months into its installation ("Knock on wood," as the Daily News said, undoubtedly with all pun intended). Good afternoon, everyone. I've got a listing of Bronx events for the upcoming week (even something on TV tonight that might be of interest). Enjoy! Rachel Leibman - Illuminations: Art Gallery. An opening reception and artist’s talk will take place on January 26, from 6:30-8pm in the Elma and Milton A. Gilbert Pavilion Gallery on the campus of The Hebrew Home at Riverdale, 5901 Palisades Avenue. This event is free and open to the public. Reservations are required by calling 718.581.1596 or e-mailing eoleary@hebrewhome.org. View the event listing at the bottom of the page here. Thursday, January 28th, 5:30 p.m. - 7:30 p.m.
What a Literary Agent Reads That Will Get You Published: synopsis and query letter writing for the almost-ready-to-be-published. Held at The Huntington Free Library, 9 Westchester Square (next to Apple Savings Bank). For more info, call (718) 931-9500 x21. How has the Bronx's Christopher Columbus High School been faring with this round of school closings? The New York Times reports on the the current state of things in this 70 year-old school, one of the last large high schools left in the Bronx. Education officials say that the "failures" of Columbus "are self-evident," as enrollment, the student body and graduation rates falter. Before the dashboard erupted in flames, a heroic school bus driver, Jamal Richards, carried four disabled children to safety on Saturday on West Mosholu Parkway South, near Jerome Ave. Three of the children were in wheelchairs, and the other used a walker -- none were injured. Coconut candy was mistaken for crack cocaine, and two Bronx men were taken into custody for possession of the sweet treats. Cesar Rodriguez and Jose Pena are planning to sue the NYPD for $2 million for carelessness and not following protocol. More than 1200 guns have been taken off the street, thanks to the Bronx gun buy-back program held this past Saturday. NY1 has video on the buy-back as well. It’s been said that there are only two things certain in life: death and taxes. Fortunately, what is not certain is the need to pay exorbitant fees and interest to have your taxes prepared and get your refund quickly. On this past Saturday, January 23rd, University Neighborhood Housing Program (UNHP), Fordham Bedford Children’s Services and Ariva teamed up for their first of ten Free Income Tax Preparation sessions. Close to sixty Bronx residents filed their income tax returns for free, allowing them to avoid costly tax preparation fees and high interest Refund Anticipation Loans (RALs). Most of the returns were e-filed, which means that clients who opted for direct deposit will receive their return in as little as ten days. In this difficult economic climate, this is money that can be used to cover everyday expenses, to pay down debt or to put towards savings. Services are available for individuals and families whose total gross income in 2009 was $56,000 or less, and who do not have a complicated return. In addition to working individuals and families, services are available to seniors or individuals whose sole income is from SSI or SSD. All of the preparers are certified by the IRS through their Volunteer Income Tax Assistance (VITA) program. Student volunteers from the Fordham Leadership Academy for Business and Technology also assisted with intake. Bronx residents interested in making an appointment for free tax preparation can call (718) 933-2539. Services are in provided in both English and Spanish at Refuge House, 2715 Bainbridge Avenue. For more information, visit UNHP's website. 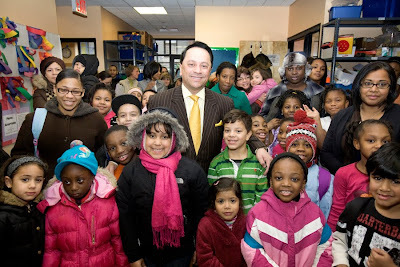 On Monday, 14th District Councilman Fernando Cabrera, his daughter and about a dozen other people from the Bronx chapter of the Latin and African-American Chaplain's Association (LACA) boarded a JetBlue flight to the Dominican Republic, carrying big bags and suitcases full of emergency supplies: antibiotics, bandages, baby food and more. On Tuesday, at 1 a.m., the crew loaded themselves and the supplies into a 12-passenger van and a jeep and made the seven-and-a-half-hour trip to the Haitian capital of Port-au-Prince. What Cabrera saw was total devastation. "It was like if you walked down Broadway and every other building or more were completely destroyed," he said, in a phone interview this afternoon, his voice hoarse with sickness and exhaustion. "It was horrible," he said. "I saw dead people. One house was crushed. There was a girl, you could tell she almost made it out because her hand was sticking out." Cabrera said more and more locals are flocking to the area's hospitals. The most immediate problem, he said, is a lack of supplies. Amputations and C-sections are being performed without anesthesia. He said the supplies are there, but they're not getting to the hospitals. This may have something to do with a fuel shortage that forces motorists to wait in lines at the few working gas stations for hours. In order to get back to the D.R., Cabrera said they paid someone $10 for a gallon of gas. Port-au-Prince is also in desperate need of more skilled physicians. He said his church, New Life Outreach International and LACA are raising money to sponsor the stays of qualified doctors. For just $7,000, Cabrera said, they can pay for 15 doctors to be in the disaster zone for a month. Through fundraising at the church and elsewhere, Cabrera said LACA is bringing in $3 million in supplies for the relief efforts. For more information and/or to donate to the cause, you can call New Life at 718-562-2230 or LACA, at 718-842-8555. They will provide you with more information about how to donate. You can also donate to the Red Cross's efforts at redcross.org, or you can just donate $10 to the Red Cross by texting "Haiti" to 90999. 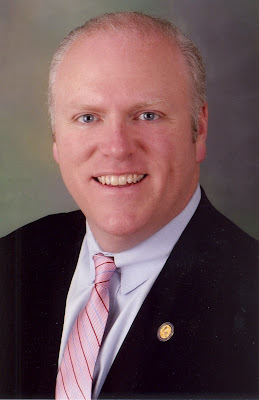 I just talked to Congressman Joseph Crowley (D-East Bronx) about the chaos swirling in Washington around the issue of healthcare reform now that the Democrats have lost their Senate supermajority. With the loss of the late Sen. Kennedy’s Massachusetts seat to a Republican last Tuesday, Democrats no longer have the 60 votes required to push the legislation through the Senate. Crowley downplayed the impact of the loss and promised to continue fighting to give all Bronx residents access to healthcare, but it was unclear how, exactly, he planned to do it in this changed political landscape. Back in the comparatively hopeful days of August, Crowley launched an interactive healthcare forum on his House Web site, designed to dispel misinformation and engage constituents in thinking about the best way to reform the system. Today, he seemed to just be hoping to get something passed. “We have to explore other options to make the changes that we were initially setting up to do,” he said. Crowley suggested that his party might use a parliamentary loophole called budget “reconciliation” to pass parts of the bill. “We might have to break up the bill a bit, to do it piecemeal,” he explained. “I think we will get something through—it may not be everything we want at first but it will be substantial. Crowley was careful to emphasize the continuing need for healthcare reform in the Bronx. “There are tens of thousands people in the Bronx that don’t have healthcare coverage today, and we are trying to make it affordable for them; there are people small businesses in the Bronx that can’t afford to buy health insurance,” he said. Police have released footage of a Bronx shooting suspect caught on tape, asking the public to help in identifying the perp. The man in the video is suspected of taking part in a shooting that occurred in December in which the victim was left in stable condition at St. Barnabas Hospital. In an attempt to remove illegal firearms from the streets of the Bronx, police and clergy members are co-sponsoring a gun buy back this Saturday, January 23, at select Bronx churches. Illegal or legal firearms may be exchanged for a $200 bank card at participating locations. The eighth Homeless Outreach Population Estimate (HOPE) will take place next week. Volunteers will scour the Bronx to count the borough's homeless population. The program seeks to tally the total number of homeless living in the Bronx as a means of collecting basic dempographic data and offering individuals shelter opportunities. After a video released yesterday showed a Bronx man being punched repeatedly by police officers while handcuffed on the ground, a second man has come forward claiming that he was also a victim of police brutality during the same drug raid that left two police wounded after an officer's gun was discharged in a narrow hallway. An article over at the Gotham Gazette discusses the history of the Kingsbridge Armory development project that led to the City Council's rejection of the project last month, and the Kingsbridge Armory Redevelopment Alliance's (KARA) role in the ordeal. And last but not least, an article from the UK discusses Oscar buzz over former Lehman College student Gabourey Sidibe for her breakthrough role in the film Precious. When City Council committee assignment were doled out this week, east Bronx Councilman Jimmy Vacca (right) was named chairman of the Transportation Committee. In a statement released today, Vacca says addressing the MTA's mountain of proposed cuts and changes will be "in his immediate line of fire." For the past several weeks, perhaps anticipating his ascension to transportation chairman, Vacca has railed against the cuts of subway and bus lines as well as the Gov. Paterson's underwhelming support for student Metrocards. Last week, there were reports that the BX34, which connects Fordham to Woodlawn, and overnight service for the BX10, which connects the rest of the Bronx to Riverdale, would be saved. But the MTA would not confirm anything and the final proposal is still being worked out. Whenever that happens, the MTA will hold hearings in all the boroughs. We'll keep you updated as we learn more. 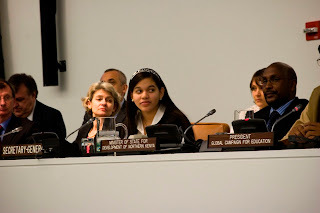 Inequality hurts the poor in the Bronx as much as in the Third World, a Hunts Point teenager told UNESCO'S annual gathering, using her own school as an example. Find her story in The Hunts Point Express. Bronx State Senator, Pedro Espada, Jr's son, Pedro G. Espada, was subpoenaed yesterday as Attorney General Andrew Cuomo ramps up his investigation into the allegedly illegal activities of Espada's nonprofit health care network and a for-profit management company he created, according to the Daily News. Pedro G. is employed by the nonprofit Soundview Healthcare Network and was also listed as an employee of Soundview Management Company, the for-profit business Espada owns and operates, for most of 2008, Cumo's office says. Soundview Healthcare Network dropped its in-house maintenance company and contracted Espada's company in early 2008 for $33,000 a month, just as Espada was beginning to build his campaign to unseat Efrain Gonzalez in the 33rd Senate District, which includes most of the northwest Bronx. Cuomo's office says Espada used some of the money the network paid his company to campaign, which would be a clear violation of state campaign and nonprofit corporation laws. According to court documents, Pedro G.'s salary with Espada's management company spiked in the months leading up to the primary in 2008 and then he dropped off the payroll immediately following it. Ouch. The Bronx unemployment rate jumped again, to 13.9% for December, compared to 13.1% in November and 9.5% in December of 2008, according the latest labor statistics coming out of the state department. And that's only counting those still actively looking for work. The city's employment rate is 10.6%. Brooklyn's is 11.2%, Queens' is 9.3%, Manhattan's is 9%. One event we left out in our previous post: the Hall of Fame brunch on Saturday at Fordham University's Rose Hill (Bronx) campus where the Yankees' winning hardware from last fall's 27th championship run will be on display. The showing, which will coincide with the Fordham Athletic Department's Hall of Fame induction ceremony (and brunch), was orchestrated by a handful of Fordham alums working for both the university and the Bronx Bombers. Yankees announcer Michael Kay (Fordham, class of '82) will emcee the ceremony. The brunch starts at 11:30 a.m. and goes until 4 p.m. It's $50 for adults, $25 for students. If that seems a little steep for brunch, the Fordham men's basketball squad takes on Temple later that day: $10 for adults, $5 for kids. Pianist Stewart Goodyear and saxophonist Christopher Sacco will be performing chamber music at the Bronx Arts Ensemble at 5000 Goodridge Ave on Monday, January 24. Tickets cost $25 and doors open at 3 pm. For more information call (718) 601-7399. The Barnes & Noble on 290 Baychester Ave. will be holding a 'writer's workshop' on Jan 22 (Friday) with author Maria Romano. Romano will field questions about writing, getting started, and getting published. The event begins at 7 pm. For more information call (718) 862-3945 or visit www.barnesandnoble.com. Folk/pop singer Roger Silverberg will be performing at the Starving Artist Cafe at 249 City Island Ave. The event begins at 8 pm. For more information call (718) 885-3779. The Mosholu Library at 285 E. 205th St. will be hosting 'Polar Opposites' on Jan. 23 at 11 am for preschool and young children. For more information, call (718) 882-8239. The Jerome Park Library at 118 Eames Place will be hosting Yoga for Parents and Preschoolers, Jan. 22 at 11 am. For more information, call (718) 549-5200. The Lehman Center for the Performing Arts, located at 250 Bedford Pk. Blvd. E., presents Salsa Lebron y La Trompeta de Perico, Jan. 23 at 8 pm. Ticekts are $35 to $50 and the event begins at 8 pm. For more information, call (718) 960-8490/8833. Wave Hill, located at West 249 Street and Independence Ave., will be hosting a family arts project titled "The Colors of Winter." Participants will create a collage of winter plant materials. The event takes place in the Kerlin Learning Center from 1 to 4 pm. For more information, call (718) 549-3200 or visit www.wavehill.org. 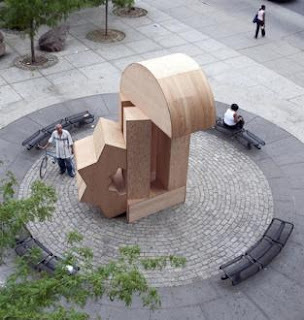 The Bronx River Art Center presents an abstract wooden art sculpture, Aurora, 14 feet tall, 11 feet wide, and 11 feet deep, at the center of West Farms Square Plaza located at the base of the West Farms Square/East Tremont Ave. subway station on the corner of East Tremont Ave. and Boston Road. For more information, visit www.nyc.gov/urbanart. Two exhibits, one a comparison of the Bronx of today with that of the 19th century, the other a celebration of Edgar Allan Poe and his time spent in the Bronx, will be on display at the Museum of Bronx History, located at 3266 Bainbridge Ave. For more information, call the Bronx County Historical Society at (718) 881-8900. A collection of Bronx students and their parents are suing the city for alleged abuses on the part of NYPD public safety officers. The plaintiffs allege that the officers, who are supposed to protect students, have been wrongfully handcuffing, assaulting and arresting the teenagers they work with. The Latin music group Aventura, whose members hail from the Bronx, are set to perform a series of sold out concerts at Madison Square Garden. The Bronx group's new album has been number one on the Billboard's top Latin albums chart for the last 20 weeks. A would-be scammer has been calling Riverdale residents posing as Rabbi Avi Weiss of the Hebrew Institute of Riverdale, asking for credit card donations of $10. Recipients of the calls have so far been wary. A rookie Bronx police officer has been suspended after being caught on a homemade videotape punching and kicking a suspect who was lying handcuffed on the ground on Davidson Avenue near Fordham Road. The cop now faces possible arrest. Thanks to community pressure, city officials are backing off of their decision to completely close Alfred E. Smith Career and Technical Education High School. The vocational school's automotive program will now be spared. The Monroe College School of Criminal Justice has opened a new courtroom at their Bronx campus which will be used for courses and community workshops. Here's a letter Bronx Borough President Ruben Diaz, Jr. sent the president of Bronx Community College last week, asking her to reconsider plans to evict University Heights Secondary School from one of the college's buildings. "[Moving the school] would not only have a negative effect on current and future students at school but would also put a stop to an educational partnership that serves as a shining example of one of the best methods in improving students outcomes and lives." The college says it needs the extra classroom space to cope with rising enrollment; teachers, parents and students at the high school want to stay where they are, believing a move will hurt students' grades. Fundraising for Haiti has been met with huge success in the Bronx. The Daily News reports on this, including last Saturday's effort, hosted by Borough President Ruben Diaz Jr. and the New York Hispanic Clergy organization, which raised over $50,000 in monetary donations, as well as two boxes of supplies. An off-duty police officer was one of four people who were injured in a three-car crash in Pelham Bay Park last night. One driver, who initially fled the scene, has been taken into custody. Timothy Honey, a Bronx man (and reportedly, a William S. Burroughs lookalike) is being sought in connection with a string of armed robberies in Greenwich Village. The Tri-State Transportation Campaign has deemed East Gunhill Road, the Grand Concourse and Broadway highly dangerous to pedestrian traffic. In their report, the organization praised city efforts, but criticized the state Department of Transportation. In addition, figures from 2009 were not reflected in the report, a year that saw its own fair share of pedestrian deaths on these streets. Tired of staring down a pitch-dark tunnel? Done with straining your ears in hopes of hearing your train screech down the tracks? Some Bronx commuters are in luck: five stations in the Bronx have received countdown clocks, tracking the arrival time of trains by the minute. Bronx Democratic Chairman Carl Heastie implores the media to look past race. When questioned as to whether he will be supporting Harold Ford Jr.'s primary run, Heastie replied, "I don't feel that I have to support him just because I'm black. There's this expectation that because he's black and I'm black, I have to run to support him, and damn a sitting U.S. senator. I'm trying to get people thinking beyond race." Possum and skunk infestations are irritating the residents of a Throggs Neck housing project. However, their demands for help are not being met. Just wondering, have you ever been able to drive from the Bronx to midtown in five minutes? "24" hero Jack Bauer need not apply. A Bronx building that was the site of a key moment in the birth of hip-hop is deteriorating in the hands of real estate investors. As the Bronx News Network noted, community members attempted to prevent the sale of the building to speculators, and its current disrepair could be a sign of things to come in the area. A new report finds that poorly maintained roads and bridges are costing Bronx commuters thousands of dollars and wasting dozens of hours spent in traffic each year. A Riverdale native is working on plans to open a brewery where he hopes to sell such brews as Bronx Riverd(ALE), Bronx Bomber Red Ale, and Mother Hefe'n Bronx. The Riverdale Press has more on the story. A bright spot in the Haiti tragedy-- a Bronx brother and sister fly to Haiti to find their elderly father, and are joyously reunited. City officials are eying Webster Avenue and Eeast Fordham Road for a possible zoning change, which they hope will revitalize the area. Ex-state Sen. Efrain Gonzalez, who, as the Norwood News noted, pleaded guilty to fraud charges last May, now has a new lawyer and wants a do-over. The Bronx Opera presentation of Mahler's “Die Drei Pintos" gets a mixed review from The New York Times. A team of robbers posing as utility workers reportedly scammed their way into six Bronx homes yesterday. No arrests have been made. Daily News columnist Bob Kappstatter thinks Attorney General Andrew Cuomo might not have the goods to nail State Sen. Pedro Espada directly. Yesterday morning, in honor of Dr. Martin Luther King, Jr., about 200 people took part in a "Walk for Peace" along the Grand Concourse. The crowd, which included State Sen. Pedro Espada, Assemblyman Nelson Castro, community leaders and clergy, met in front of the Loews Paradise Theater, before walking south, several blocks, to First Union Baptist Church for a memorial service. Inside the church, Espada, whose office helped organize the rally (and who walked behind a massive banner with his and King's faces on), took the mic to praise the civil rights leader and ask that youngsters there sign a "Resolution for Peace and Nonviolence." Espada also spoke about how happy he was to be the first Latino majority leader in the state Senate. And he alluded to Andrew Cuomo's ongoing investigation into his healthcare network, and some of the bad press (here's an example) he's been receiving. 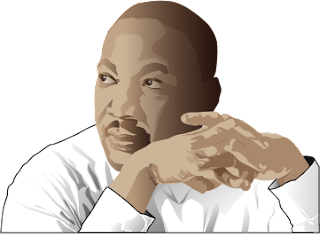 "People forget that Martin Luther King, at age 39 [when he died], was not heralded by the press," Espada said. "He was not deemed to be a man of the people. We must recall that as we read our daily papers and study the news of the day." Hit play on the podcast to hear Espada's speech. Passions ran high on Thursday night at a University Heights Secondary School parents meeting where over 650 parents, teachers and students met with Department of Education representatives and Mary Coleman, a senior vice president of Bronx Community College, to discuss the possible relocation of the school from its current site on the college’s campus. In December, the college asked the DOE to move the school so that it could use the Nichols Hall building for its own classes. The BCC student population has reached a historic high of almost 11,000 students this semester – 4,000 more than this time last year – Coleman said at the meeting, and it simply needs all the space it has. But the school community and local polititians are angry about the move, believing it will disrupt the school’s academic success. Reporting, writing, and photo by Rebecca Thomas. The owner of the American Diner on East 204th Street in Norwood is behind the fire that destroyed his business, a Foodtown, and a dental office on Dec. 21, a Fire Department spokesman told The New York Times. Mohammed Abdul Quadir was arrested yesterday on arson and other charges. The authorities believe he paid another man, Christopher J. Gooding, about $2,000 to start the blaze. Gooding has also been arrested. Quadir, who is up to his eyeballs in debt, had recently taken out a $500,000 insurance policy on the diner, and saw arson as a way out of his financial predicament, the FDNY spokesman said. Here's the Bronx News Network's coverage of the fire and its aftermath (scroll down for additional posts). It was the third major fire in the area since April. By now much of the world has learned about the catastrophic earthquake that happened in Haiti this week. I think everyone at the Bronx News Network would agree with me in saying that our hearts go out to everyone in the Bronx who has been affected by this tragedy. As reporters, we are used to covering grim news, but it never makes it easier. 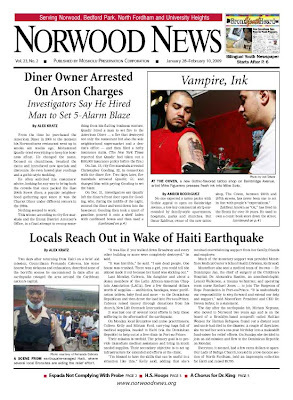 We want to share a story about the Editor of the Haitian Times, based in Brooklyn, New York, and how you can support him and his team of reporters who are in Haiti this week. Gary Pierre-Pierre, Editor of the Haitian Times, took a group of reporters to Haiti after Tuesday's earthquake. As they were unable to fly directly into Haiti, they flew into the Dominican Republic. After renting a van and buying food, water, sleeping bags, and other supplies, they drove to Haiti. Gary reports that everyone, including journalists, is sleeping in the streets. There are no bathrooms. There is no food. There is no water. Gary reports that there is no phone or internet service. Not even cell phones are working. His group is reporting in Haiti and driving back to the D.R. to file their stories. In 24 hours, Gary has already spent $2,000 on basic supplies of food, water, and gas. The Haitian Times is letting people post pictures and names of family members they are trying to locate in Haiti, and as you can imagine, their small staff has been overwhelmed with requests. 1) The Haitian Times is looking for an IT person that can help them create a site to upload pictures so that the Times staff can deal with other tasks. 2) Donate to the New York Press Association by calling (518) 464-6483. The NYPA is sending Gary money several times a day via Western Unions in the D.R. You can also send a check to NYPA at 1681 Western Avenue, Albany, NY 12203. Show your support for community media in any way you can. Go to the Haitian Times for more news. We're a little late posting this, but still worth watching. On BronxTalk this week, Bettina Damiani of Good Jobs NY talked in detail about the use of stimulus monies on a new parking garage at St. Barnabas hospital, the Kingsbridge Armory vote in the city council, and other important subjects. BronxTalk has been on the air for the past 15 years. You can watch live on Cablevision's channel 67 and Verizon Fios 33 on Monday nights at 9:00pm. The program repeats each day at 9:30am, 3:30pm and 9:00pm. On Monday, January 18 BronxTalk will feature an interview with Borough President Ruben Diaz, Jr. 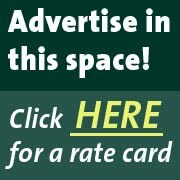 Check out the shows and post your comments! Labels: Bettina Damiani, Good Jobs NY, KIngsbridge Armory, ruben diaz jr. Happy Friday, everyone! Here's a list of events going on in the Bronx this weekend. The weather is supposed to be less frigid over the next couple of days, so take advantage! Friday, January 15th at 8:30 p.m. "Acoustic Blue Collar," featuring Frank Strazzera. Sunday, Januarty 17th at 3 p.m. Elizabeth Glushko, playing cello. Friday, January 15th and Saturday, January 16th. "Lapses in Memory: Photographs of the South Bronx in the 80's by Lisa Kahane." This exhibit will be held at BronxArtSpace, 305 E. 140th St. It will be open for public viewing on Friday 2 p.m. to 7 p.m., and the opening reception will be held on Saturday 2 p.m. to 7 p.m. Visit here for more info. Saturday, January 16th at 7 p.m. Underground Music Studios Launch Party: Food and beverages will be served, and expect special deals and giveaways! Underground Studios is located at 1728 Eastchester Road, and you can call (580) 672-9841 or e-mail undergroundmusicstudios@gmail.com for more info. Kill Me Kate, one of the bands performing at Underground Studio's Launch Party. Saturday, January 16th at 8 p.m. The Lehman Center for the Performing Arts will be holding a concert, "Ultimate DOO WOP." For a list of performances, visit the site. Tickets range from $30-$45, call (718) 960-8833 to reserve. United Action for Animals will be hosting a daylong free spay/neuter clinic for pets at the Phipps Classic Center, 286 East 156th St. Make an appointment by calling (212) 249-9178. Those who find themselves stuck in toll booth-induced traffic on the Henry Hudson Bridge can look forward to a speedier commute: The M.T.A. is formulating a plan to speed up traffic and reduce car emissions by creating more efficient E-ZPass tolls (no more slowing to a halt, then passing). Staffed booths will be slowly phased out, in the hopes of eventually reaching an all-electronic toll system. Students at the Columbia University Graduate School of Architecture will be key to the "reinvention" of Fordham Landing. Community Board 7 is asking the students to create a recreational environment out of the truckyard. A workshop for people over the age of 65 was held yesterday at the Senior Center in Throgs Neck. Attendees were presented the frightening facts: While this age group accounts for 13 percent of New York State's population, they fall victim to over 30 percent of crimes, especially money scams. Technical schools are being hit especially hard by this year's round of school closings. The South Bronx Alfred E. Smith Career and Technical Education High School has responded with a video. Nathaniel Wight, a literacy teacher and one of the collaborators of the project, said, “My own objective was to try to illustrate what would happen if these shop classes that do such amazing things with students were taken away." The Norwood News and Mount Hope Monitor are running a free journalism program for Bronx high school students. Classes will begin on Feb. 3 and run on Wednesday afternoons from 4 to 6 p.m. for 12 weeks. Students will learn the fundamentals of writing, reporting, and photojournalism through classroom instruction, and through hands-on reporting in their own neighborhoods. We will take them on field trips, and they will learn about community activism and civic responsibility, how their neighborhoods work (or don't), who has power, who doesn't and why. Students' stories and photographs will be published in our youth paper, Bronx Youth Heard. Click here for more information and to download an application form. The deadline for applying is Jan. 22. The first 2010 edition of the Norwood News is out on streets and online now. Here's a quick preview of what you will find. New Councilman Fernando Cabrera's first term got off on the right foot with a rousing inauguration ceremony at Bronx Community College and the successful opening of his district office. A start-studded politcal crowd showed up to the inauguration. Tenants at a Decatur Avenue building in Norwood are battling their landlord in court, saying they aren't getting the services they deserve. Tenants at a Fordham area building say their seasonal decorations have led to a safer environment. 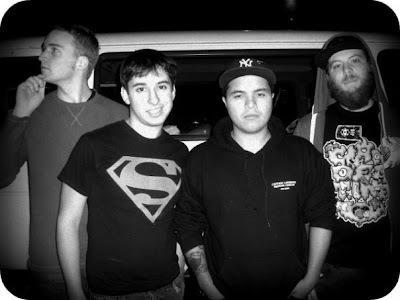 Norwood artist Ivan Velez, Jr. perseveres in the narrow-minded comic book industry. A popular local theater program perseveres despite funding cuts. Plus: Espada wants more charter schools . . . Koppell on the Armory . . . Local residents on their hopes for the next decade . . . our Out & About arts and entertainment calendar . . . and find vital help, programs and services in our Web-expanded Neighborhood Notes section. With a little help from the NY Times Neediest Cases Fund, the sky's the limit for a bright Bronx teenager with a passion for community service. Attorney General Andrew Cuomo's office is closing in on Pedro Espada, Jr. According to court papers filed yesterday, there is "extensive evidence" that the embattled state senator and majority leader used monies from his network of health clinics to help advance his political career. A typically bullish Espada is calling it a "witch hunt." In an editorial, the Daily News calls Espada a "taxpayer-fleecing, subpoena-ducking con artist." If his fellows Democrats "want any credibility as ethics reformers, they need to strip him of his lofty title and privileges," the paper says. Espada says his driver is to blame for parking his Mercedes-Benz in front of a fire hydrant on Jan. 2, and that the State Police placard in the window was obtained legally. A peek at the borough's most talented high school football players. Police responding to a house fire in Allerton on Tuesday found marijuana plants, grow lights, and several guns. The Bronx County Republican Committee has a new headquarters. At a public meeting on Monday, teachers, parents, and students from Alfred E. Smith Career and Technical Education High School on East 151st Street, asked the Department of Education to reconsider plans to close the school. In a victory for the UFT, teachers at a Bronx charter school have voted to unionize. The New York Public Library has a new Web site. District 14 Council Member Fernando Cabrera held a press conference today to talk about his plan to help victims of 7.0 magnitude earthquake that ravaged the Haitian capital yesterday afternoon. Cabrera, along with a team of church and district leaders, will be on a flight to the Dominican Republic on Monday, noting that it would be easier and faster to cross the border into Haiti than fly there. First and foremost, Cabrera's team is taking into account the Consulate General of Haiti's immediate call for medical services. They have noted that survivors of the earthquake are largely affected by a need for medicine, especially those who suffer from high blood pressure or diabetes. Due to vast hospital overcrowding, there has also been a call for tents in order to remain operational even outside normal hospital facilities. This will be the team's immediate concern, channeling their initial efforts into the hospitals and general medical care. Cabrera's New Life Outreach International church emphasizes humanitarian efforts abroad and has completed projects in the Dominican Republic an Africa. Also in attendance was Fritz Jean, CEO of the Mount Hope Housing Company, a member of Cabrera's team and a first-generation Haitian. Expounding upon Cabrera's call to immediate action, Jean added, "We have to sustain the movement." Jean is only one of the many leaders in attendance that will be continuing to accept donations - monetary, clothing, medicine, food and water - throughout their campaign. Also addressing the widespread concern as to where funds will go, Jean promises that "the resources will get to the people," and the funds and donations will be doled out to everyone in need of them, as well as avoiding the fizzle-out affect that plaques many aid missions. When asked what our readers could do immediately, Cabrera encouraged involvement. The team is currently raising more money to provide medical supplies, but food and water will soon follow. Cabrera wishes to point our readers to the Latin- and African-American Chaplain Association (LACA): Call (718) 842-8555 if you wish to donate or help in any way. This Saturday, at the intersection of Aldus Street and Southern Boulavard, Bronx residents (and others) can drop off clothes, non-perishable food, and money, to help the victims of yesterday's earthquake in Haiti. The aid drive is being organized by Bronx Borough President Ruben Diaz, Jr., State Sen. Ruben Diaz, Sr., and the New York Hispanic Clergy Organization. It starts at 12 p.m.
Tragedy has struck the Haitian people and as a community The Bronx is ready to give them a hand. I am calling on all Bronxites to show solidarity and support, making donations through our office at Saturday’s event or through any of the many relief organizations available. In difficult times, we all can make a big difference with donations, even small donations, that will help to provide food, water and medicine to the victims of this terrible natural disaster. For more information, call Diaz, Jr.'s office at (718) 590-6001. Labels: earthquake, haiti, ruben diaz jr.
Attorney General Andrew Cuomo's office says it has discovered "extensive evidence" of illegal activities by State Senator Pedro Espada, Jr. involving his nonprofit Soundview Healthcare Network and a private for-profit management company he created, according to court paper filed in New York Supreme Court today. The court papers are basically a "motion to compel" Espada to produce a number of documents related to Cumo's investigation, which was launched earlier this year. Cuomo subpoenaed a host of documents on Aug. 25, but his office says Espada has failed to produce many of them. So, just to be clear, no charges have been filed against Espada. But this is a pretty big precursor to potential charges. The Daily Politics blog has a good summary of court papers and you can read them for yourself after the jump. The controversial Bronx pol, who is no stranger to investigations and/or allegations of illegal or improper behavior, responded in a statement, saying the Cuomo investigation is "witch hunt" and that he's already complied by sending "tens of thousands of documents" the A.G. has requested. "This is an Andrew Cuomo witch-hunt driven by his political ambitions, as evidenced in the fact that our attorneys had to learn of this complaint through the media," Espada in his statement. Regardless, Cuumo wants more and he will probably need it if he wants to come up with something that sticks on Espada. The "Teflon Don" of New York politics, Espada has narrowly escaped serious legal punishment several times in the past. Bronx Borough President Ruben Diaz Jr. will be announcing today his plans to create an African Advisory Council, hoping to give a voice to the steadily increasing West African population. This was also prompted by attacks on this group -- there have been 23 attacks against West Africans in the past 18 months alone. The council will be made up of 29 members, and Famod Konneh will be the chair. Apparently baked goods aren't recession-proof. Bronx baking company, Old London, plans to pack up and move to North Carolina, putting over 200 people out of work. The sting of this company closing is felt particularly strong, especially taking into consideration the closing of the Stella D'oro factory in Kingsbridge this past October. On a similar note, foreclosures are reaching an all-time high in the Bronx, as we see an upsurge of foreclosed homes for sale. Unemployment is largely to blame, according to the Fiscal Policy Institute, a nonpartisan research group. A massive gun buyback program at various locations throughout the Bronx has been announced for next Saturday, January 23rd. Interestingly, air pistols and BB-guns are eligible for payment (I'm assuming to prevent any unfortunate incidents involving broken glasses...). For locations and contact information, visit here. In more entertainment news, bachata super-group from the Bronx, Aventura, is looking at some impressive Madison Square garden ticket sales. They'll be going up against the current queen of Top-40, Lady Gaga (who swears on her life that she's not from Yonkers... but who is she kidding?). Labels: african advisory council, aventura, Bronx gun buy back, Foreclosure, gilberto sanchez, old london, ruben diaz jr.
On Martin Luther King Day, volunteers will work at MS 424, The Point CDC, SEBCO, Rocking the Boat, Hunts Point Alliance for Children, Manida Street Housing, HYDE Leadership Academy, Hunts Point Recreation Center, WildCat Academy, Casita Maria, Pio Mendez, Helping is Easy, Transformations Church, PS 75, PS 48, PS 130, and PS 333/335. Find out more in The Hunts Point Express. The Manhattan Young Democrats are selling these. 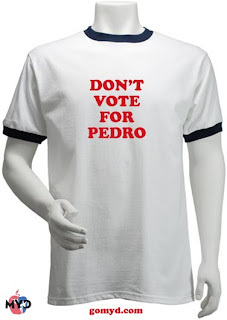 Putting aside for a moment the fact that no Manhattanite can actually vote for Pedro Espada, seeing as he represents the 33rd Senate district in the Bronx, we imagine that this will be a potentially hot item here in the Boogiedown. And while anyone in the district can choose not to vote for Pedro, they can't, at this point, choose to vote for anyone else, as there aren't any challengers yet to the controversial lawmaker, who singlehandedly flipped the balance of power in the State Senate to the Republicans and back again to the Democrats over the summer. We're hearing some murmurings about possible challenges, but nothing definitive yet. Stay tuned. This isn't really exactly a Bronx thing, but we couldn't resist: The New York Post reports that the city's new comptroller, John Liu, is requiring staffers to rise when he enters a room and address him as "Mr. Comptroller." A Post editorial says Attorney General Andrew Cuomo needs to successfully connect the dots on State Senator Pedro Espada's alleged funneling of state money to his health center business or the AG's office does not deserve the greater authority Cuomo is seeking. Insiders say it was no accident that Attorney General Andrew Cuomo unveiled his investigation of controversial state senator Pedro Espada on the heels of Gov. David Paterson's state of the state speech. “It shows action to Paterson's prose,” one Democratic insider says, referring to the governor's promise to push for reforms. Another Democratic aide calls Mr. Espada a “perfect target” because Mr. Cuomo can burnish his “cleaning up the Legislature” credentials without alienating the powers that be, as Mr. Espada is disliked by many colleagues. “This becomes especially valuable if Paterson fails to deliver on any of his proposed reforms, while Cuomo collects a trophy scalp to wave before the angry masses,” the aide says. Mr. Cuomo is looking for evidence that Mr. Espada broke laws by seeking funding for nonprofit organizations that he controls, failing to report campaign contributions, or living in his Westchester County house while portraying his Bronx apartment as his primary address. The legislator brought the state Senate to a standstill last year by defecting to the Republican conference and then back to the Democrats. “Pedro Espada, for better or worse, is the symbol of all that is wrong in Albany,” the first insider says. Speaking of Espada, again, those in the political blogosphere who can't stand the idea of him running in the Democratic primary this September unopposed are raising the prospect of drafting Lilliam Perez, who is on the staff of State Senator Eric Schneiderman.. She had expressed interest in the seat a while back but then backed away. And the last word today on Esapda: Believe it or not, the Boogiedowners, the Bedford Park bloggers who are no fans of the senator, say they had a good experience at one of Espada's health centers in Wakefield, where they went to get the flu vaccine for their daughter. A pregnant Bronx woman is still waiting for an apology from Howard Safir (former police commissioner under Rudy Giuliani) who hit her with his Ford Escalade as he was backing up in Manhattan and drove off. He told investigators he did not know he hit her and has not been charged. Parents are rallying to save Christopher Columbus High School, which is slated for closure. The Times reports that unionized workers of the New York Public Library can take paid leave or receive comp time when the temperature dips below 68 degrees at a branch. Sunday Dec 13th 2009, Lehman Center For The Performing Arts: In celebration of the 2009 holiday season, passionate Michael Spierman conducted The Bronx Opera Chorus and The Orchestra Of The Bronx in their traditional annual performance of a timeless holiday concert, Handel’s Messiah. Following the performance the audience were treated to “A Taste of the Bronx,” a food show produced by the Bronx Tourism Council. As always, it is a pleasure to make photographs at Lehman Center. I would like to thank all the people behind the scene at Lehman Center, who make all shows a success, with a lot of planning and hard work. Thank you. Improvements to University Heights Secondary School, including new grips on the stairs and working water fountains, spelled bad news for students as they returned to school after the holiday break on Monday. The renovations were made as part of Bronx Community College’s expansion plan that will leave this high school homeless. 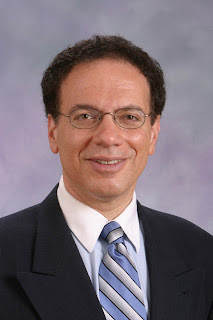 Dr. Pierre Renelique used to practice obstetrics and gynecology in Florida. That was until the Florida Board of Medicine revoked his license early this year following a botched abortion. Now he’s working in University Heights. This month's issue also includes a roundup of our main stories from 2009. A 10-man brawl broke out yesterday night in front of a Radioshack in Longwood. Two of the men have been left with stab wounds from a screwdriver and are currently being treated at Lincoln Hospital. The remaining eight men managed to disperse before police arrived. Robert Finn, former U.S. Ambassador to Afghanistan, recounts how his childhood in MetLife's exclusive Parkchester housing development opened his eyes to injustice and social stratification. Finn references his experiences in Azerbaijan, Kazakhstan, Pakistan and Afghanistan. Plans for an expansion of Van Nest Park are finally given the green light. Proposals include more play equipment, areas to lounge, more lights and a flagpole for the park's World War I memorial. Some local residents express traffic and parking concerns, but are actively seeking compromise. A group of Bronx teens are treated to a tour of the White House. The members of the Bronx Youth Empowerment Program had traveled to Philadelphia to campaign for President Obama last year, and as a reward are also treated to a discussion with White House political director Patrick Gaspard. Meant to put this up earlier in the week. Cabrera's made it abundantly clear that he wants people calling these numbers, stopping by, hanging out, asking for help and even creating new problems at his district office. His skeleton crew staff, pictured here from left to right, constituent services workers Anthony Springer, Timothy Tapia and Chief of Staff Greg Faulkner, have already achieved their first taste of successful advocacy. Yesterday, a young area couple was in the office looking for assistance after being denied shelter by the city's Department of Homeless Services (DHS). After contacting DHS, a case worker soon called back and said they would be there in 10 minutes. Maybe 8 minutes later, the case worker showed up. They went over the couple's case and, although they haven't quite worked out all the details, the couple was at least given temporary shelter. Imagine the possibilities. Give the Councilman a call.